James Wade almost loses for the second time in his career his first match as defending champion, but survives several matchdarts against Stephen Bunting and wins the match after all. Unfortunately for him, the titleholder loses his second match at the UK Open against Colin Lloyd and makes sure that the tournament will get a new champion. This new champion will eventually be a Scotsman. 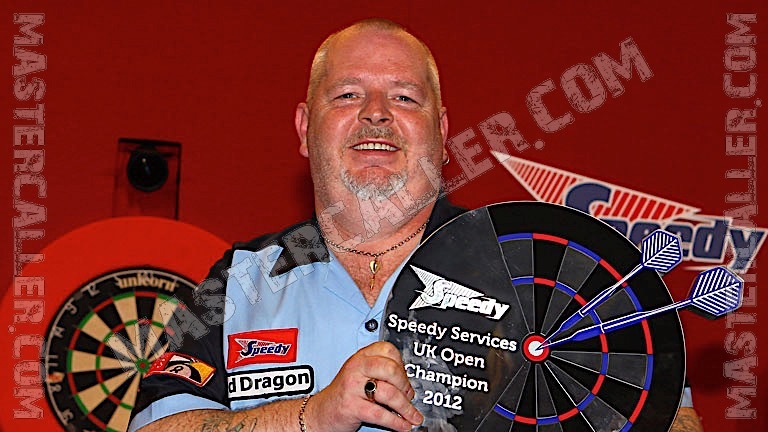 Not Gary Anderson but Robert Thornton boosts his career by winning the UK Open 2012. He defeats Mark Webster, Gary Anderson, Dennis Priestley, Wes Newton and Dave Chisnall to reach the final, where he meets Phil Taylor. The Power had an impressive run by defeating Roland Scholten, Ronnie Baxter and Terry Jenkins, but he could not bring this level to the final. Scotsman Thornton hit the doubles extremely well and claimed victory over the Power: 11-5. Raymond van Barneveld will prove to be the best Dutch player in this tournament. In the last 16 he defeated Peter Wright in a deciding last leg, but in the quarterfinals Dave Chisnall shows his form. He plays a good match and defeats Barney 10-5.